Varvara Harmon - Multimedia Artist and Website Designer. also she paints portraits of people, pets and homes, and she accepts commissioned work. She creates in different media - oil, acrylic, watercolor, silk paintings, ink and pencil drawings. Varvara has received numerous awards for her paintings and has been juried into many international and national exhibitions and her paintings have been featured in International Artist and American Artist Magazines. 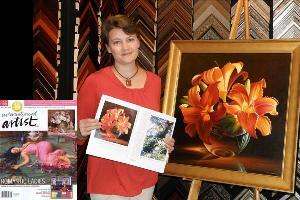 Her art work is in private collections worldwide. I am teaching Watercolor, Oil, Acrylic and Drawing workshops and painting classes. Please email me for more information or sign up for upcoming workshops newsletter.